The aliens are coming!! The aliens are coming!! Oh, wow, and they've got a really nifty flying saucer, with lights and otherworldly sounds! Have you ever wanted to make your own prop UFO model with lights and sounds that react to the tilt of the craft? Me too! Plus, you can hang it from a piece of fishing line and make your own sci fi B-movie special effects! You can build your own flying saucer using paper plates, or 3D print a model, or even modify a plastic model kit. 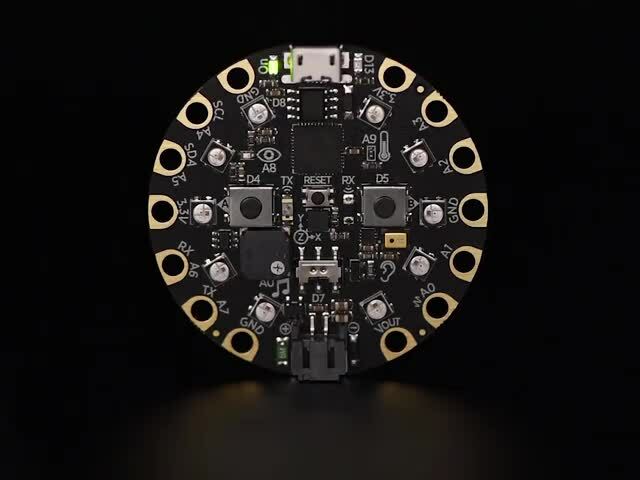 You'll just need a hole in the bottom for the Circuit Playground Express's NeoPixel LED lights to show, and room for the battery pack inside. You'll also want to get a small, clear plastic drinking cup to use as a tractor beam and stand to display your UFO, as well as some optional sandpaper to scuff up the interior of the cup. Awesome microcontroller board packed with features! Check out this John Park's Workshop LIVE episode for more info and a flying saucer 3D modeling session! This guide was first published on Oct 24, 2017. It was last updated on Oct 24, 2017. This page (Overview) was last updated on Apr 20, 2019.